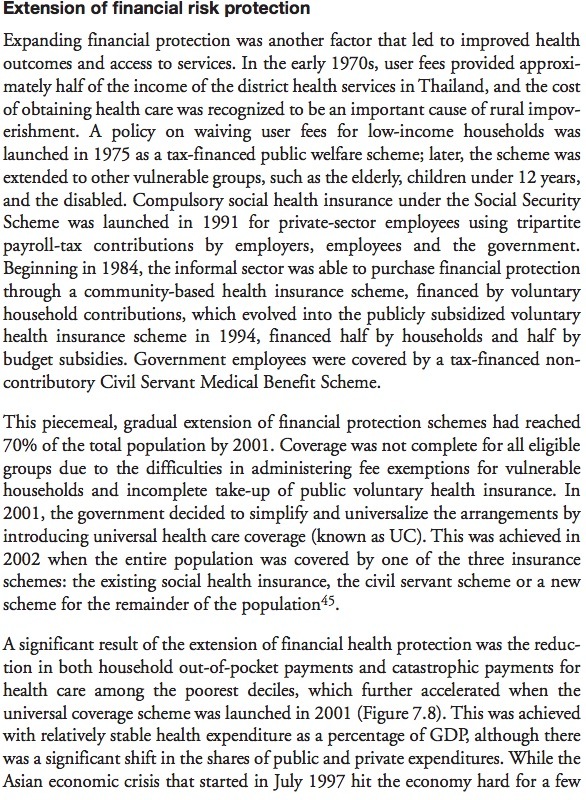 Launched in 2001, the UCS covered the remaining 47 million people, mainly those who were not enrolled in two other health schemes – the civil service medical benefits for government officials and family members, and the social security scheme for employees in private sector. An assessment by a group of independent health system researchers and economists from international organisations including the World Health Organisation, found that this universal health coverage has prevented over 80,000 families from bankruptcy due to timely health treatment during its 10 years of implementation. 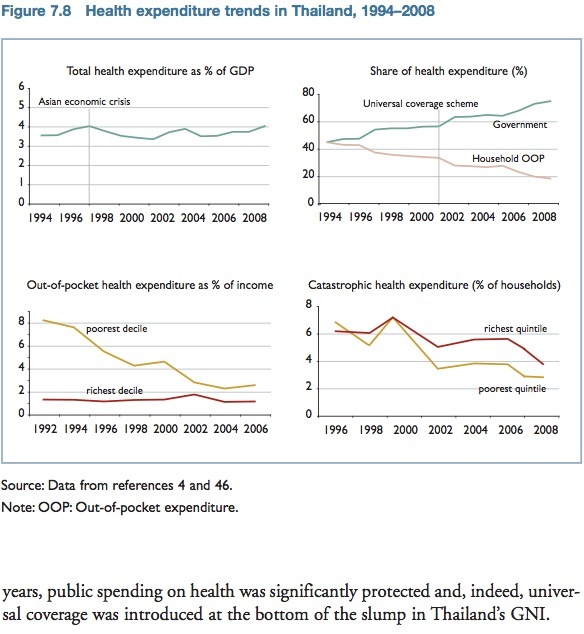 Conducted in 2011, the assessment showed that catastrophic health expenditure dropped from 6.8% in 1996 to 2.8% in 2008. Impoverishment as measured by an additional number of non-poor households falling below the national poverty line due to medical treatment costs, was reduced significantly from 2.71% in 2000 prior to the UCS, to 0.49% in 2009. Progress in the universal health scheme was also indicated by increasing outpatient visits per member per year from 2.41 in 2003 to 3.64 in 2011. The number of hospital admissions almost doubled between 2003 and 2011. Data from 2010 showed a very low prevalence of unmet needs for health services in Thailand. The report suggested that considering the positive results, the scheme should be maintained, even extended to minimise out-of-pocket payment and prevent impoverishment caused by healthcare expenditure among a majority of the population. According to the book Good Health at Low Cost 25 Years On, launched during the week-long Prince Mahidol Awards Conference, Thailand outperformed many other countries in improving health outcomes at a low health funding per capita of 2,755 baht. BP: BP has blogged about the universal healthcare scheme (UCS) previously and particularly its popularity, but also the dislike of the scheme from some sectors of Thai society. The scheme was one of those policies that in the words of The Nation pandered to the “unprincipled wants and needs of the attention-deficient, politically apathetic masses”. BP: When voters were interviewed a couple of years ago, there are two policies which stood out, namely the universal healthcare scheme (ie 30 baht scheme) and the village fund – this matches with BP’s own observations. Such policies are not just pandering to the “unprincipled wants and needs of the attention-deficient, politically apathetic masses” and they didn’t bankrupt Thailand. Many other policies were hit-and-miss, but there is good data for the universal healthcare policy and the village fund policy* to show that they worked. Hence, this explains Thaksin’s continued popularity today and the problem for a non-Thaksin party to win an election. *On village fund, see here.